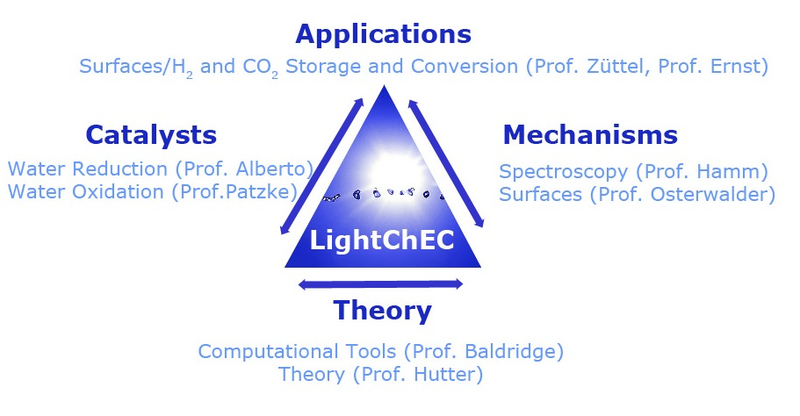 The URPP LightChEC is a joint project between the Department of Chemistry and Department of Physics of the University of Zurich and the EMPA in Dübendorf. The objectives of the project are the discovery and development of new molecules, materials and processes for the direct storage of solar light energy in chemical bonds. The LightChEC research program is structured in seven interdisciplinary research topics, which are each lead by a different research group. The objective of our research within the UFSP is to provide mechanistic insight into how novel catalyst molecules and photosensitizers, developed within the UFSP for the homogeneous water splitting route, might perform when adsorbed on a solid surface. For this purpose, a small set of model systems will be established, including at least one for each type (WRC, WOC, PS), and characterized in terms of adsorption geometry and bonding, charge redistribution upon photoexcitation and excited state life times. Such knowledge will assist in designing strategies for building a heterogeneous system required for a continuously operating visible-light-driven water splitting process. Figure 1: (left) Ultrahigh vacuum system in the Surface Physics Laboratory, comprising facilities for preparing atomically clean single-crystal surfaces and molecular monolayers, as well as various surface sensitive characterization techniques. (right) Sample stage inside the preparation chamber, showing the cylindric sample holder with a TiO2(110) crystal mounted on top. The heterogeneous route to a solar-light-driven water splitting process, where catalyst molecules and photosensitizers are immobilized on a suitable solid substrate, is technologically compelling because the water reduction and oxidation steps can be spatially separated, thus avoiding unwanted recombination reactions and facilitating separation of the produced gaseous hydrogen and oxygen. Since catalytic activity and selectivity are strongly related to the molecular structure and the accessibility of the active sites to the reactant molecules, structural investigations of adsorbed catalyst molecules are of interest for understanding the mechanism. We apply rigorous surface science methods, including low-energy-electron diffraction (LEED), scanning tunneling microscopy (STM) and x-ray photoelectron diffraction (XPD) in order to study the bonding geometry of adsorbed molecules in vacuo. Fig. 1 shows the multitechnique instrument available in our laboratory. Several other factors influence strongly the catalyst performance upon attachment to a surface, like energy shifts and rehybridization of molecular orbitals and charge redistribution and charge dynamics upon photoexcitation. Such effects are studied by means of ultraviolet photoelectron spectroscopy (UPS) and its angle-dependent variant (ARPES), as well a by time-resolved photoemission and two-photon photoemission. Such fundamental studies are complemented by measurements of the activity for water splitting, where such surfaces, prepared under highly controlled conditions, are brought into water and exposed to visible light. These studies are carried out with novel water reduction and water oxidation catalysts, developed within the URPP LightChEC, and eventually also including photosensitizers. In close collaboration with the synthetic chemists, strategies will be developed for obtaining stable surface bonding of the catalyst molecules and maximum activity and photostability.